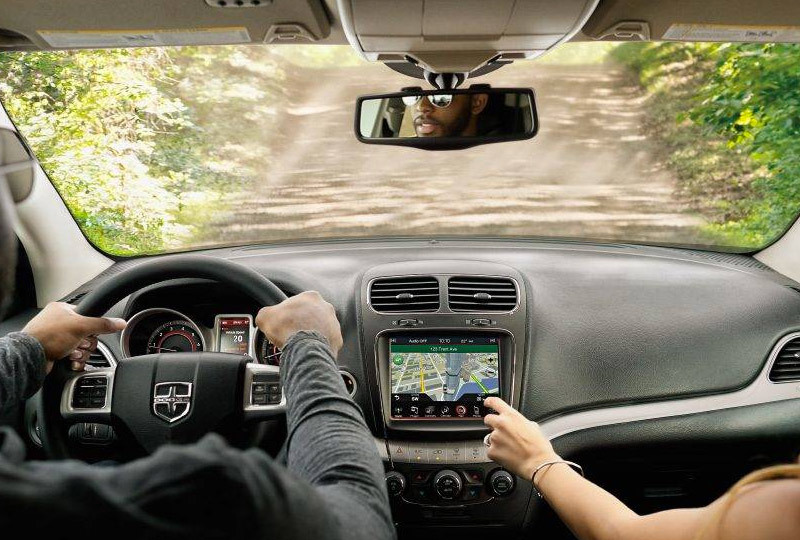 Go forth without fear in your Dodge Brand vehicle with available Uconnect® Navigation guiding you and delivering information about your route along the way. Sensor-assisted GPS ensures that you'll be able to find your way no matter what destination you have in mind. The available Navigation feature allows you to identify points of interest quickly and easily with stunning 3-D graphics and detailed views of landmarks, cities and terrains. Or simply say an address to get directions with one-step voice destination entry. No matter where your travels take you, sensor-assisted GPS helps ensure accurate positioning for your vehicle-even as you travel through tunnels, indoor parking garages and other areas where GPS signals can become obstructed. 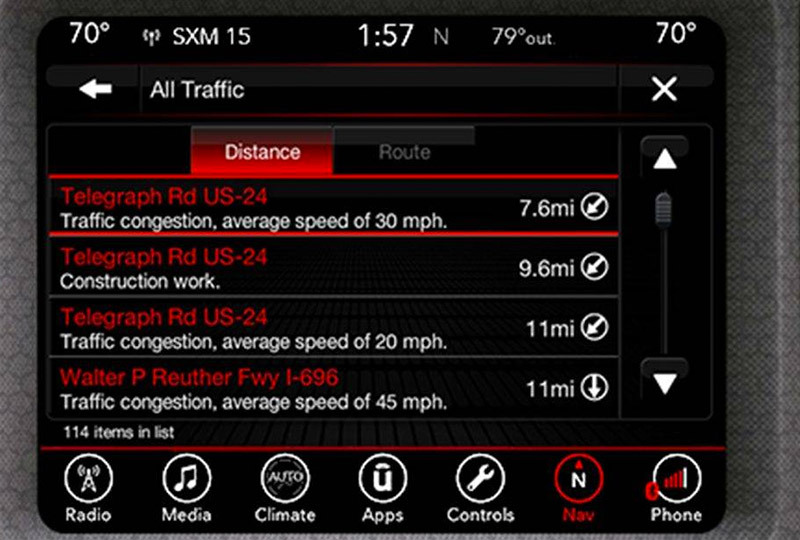 The available SiriusXM® Traffic Plus* service helps you avoid congestion before you reach it. With detailed information on accidents, construction, road closures and traffic speed, you'll get to your destination easier than ever before. Available SiriusXM® Travel Link** delivers the information you need where you need it most. Get detailed weather information including five-day forecasts, weather maps and severe storm alerts, plus fuel prices in your local area, movie theater listings and sports scores for your favorite teams. Now you can stay in the know while you're on the road. NEED HELP WITH YOUR UCONNECT® SYSTEM? SiriusXM services require subscriptions, sold separately after the 5-year trial included with the new vehicle purchase. If you decide to continue your service at the end of your trial subscription, the plan you choose will automatically renew and bill at then-current rates until you call SiriusXM at 1-866-635-2349 to cancel. Trial service is not transferrable or refundable. See SiriusXM Customer Agreement for complete terms at www.siriusxm.com. All fees and programming subject to change. Satellite service is available only to those at least 18 and older in the 48 contiguous USA and D.C. Internet radio service is available throughout satellite service area and in AK and HI with limited coverage. **This feature does not work while the vehicle is in motion. SiriusXM services require subscriptions, sold separately after the 5-year trial included with the new vehicle purchase. Trial service is not transferrable or refundable. The SiriusXM Travel Link data displays and individual product availability vary by vehicle hardware. 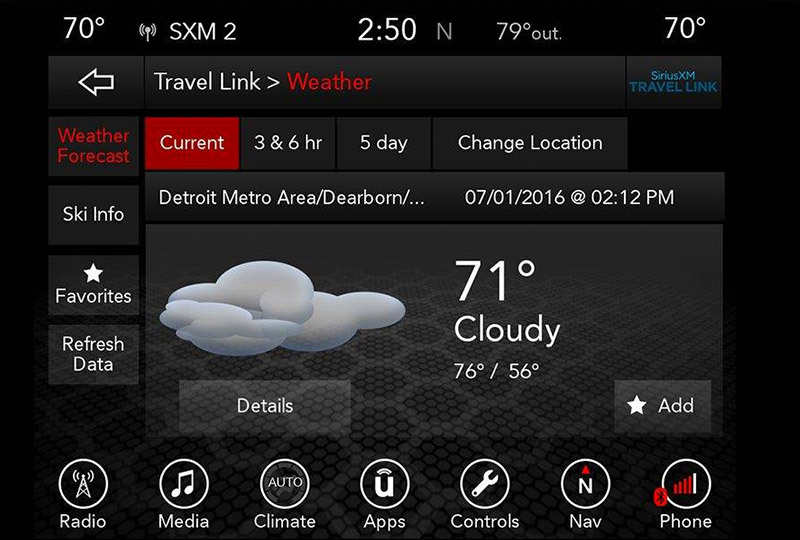 Not all vehicles or devices are capable of receiving all Travel Link services offered by SiriusXM; Weather Forecast, Current Conditions may not be available in all locations; and features of individual systems will vary. Images above are for representative purposes only and are not real products. For actual features and images of real products, consult the vehicle manufacturer. SiriusXM is not responsible for any errors or inaccuracies in the SiriusXM Travel Link services or their use. Satellite service is available only to those at least 18 and older in the 48 contiguous USA and DC. Internet radio service is available throughout satellite service area and in AK and HI with limited coverage.